Ayep. But the premise is false, Mr. Cerf. The single biggest variable is not teacher effectiveness. It may be the single biggest variable that the school can control, true, but poverty matters more. The quote above is disingenuous. Mr. Christopher Cerf, our (NJ) acting education commissioner, wants us to believe his proposals are "pro-teacher." You spent a good chunk of your career overseeing the financial collapse of Edison Schools, Inc., a company started by Chris Whittle, a company whose purpose was to privatize schools. Shouldn't we put past data to good use? Let's limit our education commissioners to those who have successfully led other enterprises in the past. When I was still succoring the afflicted, one of the best obstetricians in our county specialized in high-risk deliveries. Because he specialized in high-risk deliveries, his statistics were skewed a bit when compared to obstetricians who handled the safer pregnancies. Obtaining malpractice insurance became prohibitive. He stopped catching babies, though he still got paid to offer advice to the docs who had enough normal deliveries to keep their malpractice insurance intact. Poor students are, as a group, at higher risk for school failure than wealthy children, for a whole lot of reasons independent of who teaches them. Teachers matter, and they matter a lot. Their results matter. If you rely on state testing to determine a teacher's effectiveness, those of us who choose to teach high-risk students will take a hit, no matter how effective we might be. The rational among us will head to the hills--Short Hills and Far Hills--places with remarkable wealth and remarkable students with remarkable resources. All of our children can learn, and all of them are remarkable students. Until every child I teach has the same full belly in the morning, the same warm bed at night, the same bookshelf full of books, the same access to libraries, and the same electronic media sitting on the same desk in the same bedroom at home, even Albus Dumbledore and his merrie wizards would not fare well under your proposed system. The great experiment of Edison Schools failed for a lot of reasons, most of which were likely out of your hands. It was a lousy idea, anyway, at least if you have any truck in democracy and public institutions. How ironic that you, with a checkered history in private industry, now lead the move to dismantle public education here in Jersey. 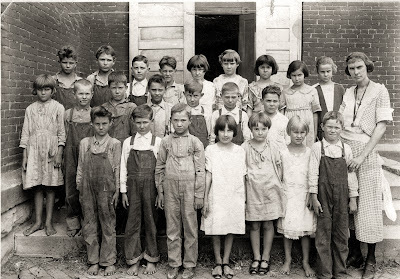 The photo is via Shorp, taken in Foster, Missouri, in the 1920's. I like your OB analogy. I want to ask you, now that I have my root box (! ), how DO you keep roly-polies alive? And the pond water? Doesn't it evaporate? You've had it for years so how to you make up for the evap- tap water or more pond water...? I toss fish food pellets, paper rags, and occasional bits of veggies (I gave them tiny Brussels sprouts from the garden last week). There's also an old stick and some dried grass in the tank. I think the slugs eat the pellets, not sure about the sow bugs. I need to go read up on them. As far as water, I mostly dechlorinate some water and dump it in now and again. When I get nervous about too much mineral build-up, I steal distilled water from the chemistry teacher. I should think about doing a water exchange, but that would put a big dent in the population.